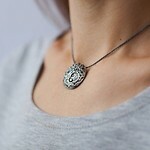 Square pendant in silver of unisex style with the word "Buddha" in Tibetan. 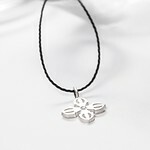 Sizes of the pendant: 31x7 mm. A cord is not included in set for the pendant. You can order it with cord stoppers or a chain of desired length in Chains and cords section.